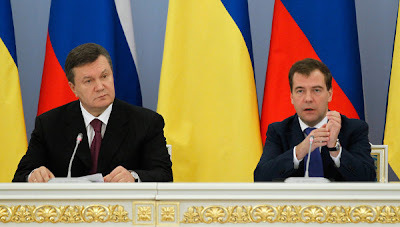 GORKI, Russia -- Russian President Dmitry Medvedev said on Friday that Moscow fully supports Ukraine's decision to remain a non-allied state. Viktor Yanukovych (L) and Dmitry Medvedev. Ukraine has recently passed laws confirming its non-aligned status and dropped its NATO membership bid. "In our opinion, it is a logical development of events, and we believe that it meets the interests of the existing European security system as well as Russia's long-term development interests," Medvedev said at a joint news conference with his Ukrainian counterpart Viktor Yanukovych near Moscow. "We have always maintained a simple view of Ukraine's accession to NATO - it would destroy European security - it is a sensitive issue for us," Medvedev said. Ukraine sought NATO membership under President Viktor Yushchenko. His successor, Yanukovych, who came to power in February, has said the country does not seek alignment with any military bloc, but needs to maintain good strategic relations both with NATO and Russia. Despite dropping its NATO ambitions, Ukraine plans to continue its partnership with the Western alliance. According to a draft plan for military cooperation with NATO for 2011, Ukraine and NATO will hold over 20 joint events next year. Ukraine also said it was ready to take part in NATO's European missile defense project.